Shakti without which Shiva is a corpse could be found in self and in each and every speck with which the fabric of the universe is woven. And if as a pilgrim one wishes to reach one of the 51 Shaktipeethas, Vindhyachal could be the destination to reach to, some 78 Km away from Varanasi. The town is well-known for the celebrated temple of Vindhyavasini through which Ganga passes sharing the divinity established here. Pilgrims coming to Banaras on road more often than not cover the destination as a part of their pilgrimage. Devi temple being just 8 Km away from Mirzapur, becomes a centre of holy expedition and devotee-pullers from different corners of India. Navratras in the Hindi month of Chaitra and Ashwin are celebrated with a great zest, just as the Kalikhoh competition in the month of Jyestha and the colors of the festivals touches the places nearby as well. Temple of Maa Vindhyavasini is referred to as with various others names like Siddhipeeth and Maniddweep. Puranas tell about falling of the back of dead Devi Sati, holy consort of Lord Shiva, after dying at Yagna of her father Daksha making the place pious. Since then the pilgrims and devout Shakti followers always make a trip to Vindhyachal to worship the Devi who is representation of Maa Lakshmi. Another place some 3 Km away from Vindhyavasini Temple finds its connection with the birth of Lord Krishna. It is believed that Ashtabhuja an incarnation of Goddess Mana Saraswati as the sister of Lord Krishna who took birth before him to warn Kamsa of his wrong doings and evils before mysteriously vanishing in sky. It is believed that she came here; an event marked by a temple dedicated to the Devi. 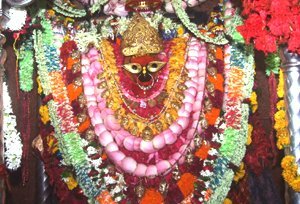 Kalikoh temple, holy caves when Goddess Maa Maha Kali is believed to be residing is also visited by her adherents completing the cycle of the three temples. It is only 2 Km away from the main temple. She is the one who vanquished and slayed demon Raktabeeja. Vindyavasini Temple: The temple could be reached by crossing stairs to Mother Goddess, where she is consecrated in the form of black idol with huge silver eyes in very small sanctum, called Garbhgrah. Adorned with various gold ornaments the, the magnetic allure of the Devi seems purifying the soul. The other nearby sacred sites here that are a must visit for devotees of Shakti is Ashtabhuja and KaliKoh Temples. Sita Kund: Connected with the epic professing the ideals of a balanced life which is Ramayana, this is the place where Lakshmana used his arrow to bring out water for Devi Sita when she found no water body nearby to quench her thirst. Worshippers can cover 48 steps to reach the kund and relive that moment of mythological past. By Air : Nearest place to which one can fly to reach Vindyachal is Varanasi from Delhi, Varanasi and Khajuraho. By Train : The place could be easily reached by a railway station in Vindhyachal and if not, the railway station at Mirzapur can also be considered as an alternative option just half an hour away. By Road : Through Mirzapur the place is very well connected.